Bridal wedding dresses: Every bride chooses a perfect wedding dress for her perfect wedding. In past brides’ mostly preferred white colored wedding dresses. Now in this modern era, brides have the wide variety of options over colors. Patterns and other when it comes to picking their wedding dresses. Wedding day would be the most planned occasion for every girl right from their teenage periods. They would love to carry their wedding planning inch by inch after getting advice and elders blessing on every event. Once the bride has their dream wedding dress, the rest is nothing. It doesn’t matter whether it’s the styled signature format for vintage model one. Wearing the dreamed wedding dress would always give satisfaction. And they might be looks pretty brighter than ever. 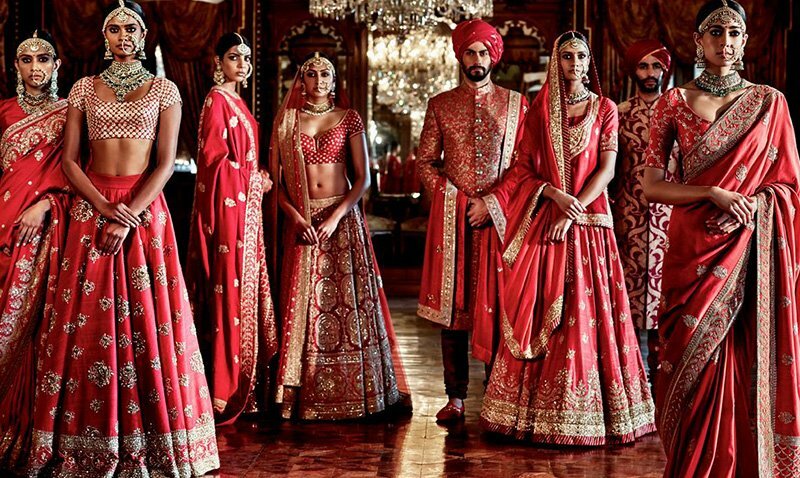 When compared with the groom, a bride gives more importance to the wedding dresses. Especially when it comes to wedding gown or another wearable. These days wedding organizer prefers color themed wedding events. In which couples can wear skirts in same color matches with the wedding theme. To be frank, every color has its significances. Here are the few things to be aware of picking suitable color themed wedding dresses. Blue: Well, it’s a worldwide believed myth that the blue color is an agitated and neutral color. On the occasion of the significant function being calm is important, wearing your wedding dress in blue color would give the couple real quality and wealth in addition to the calmness. Yellow: Yellow often referred as the uplifting color and also termed as the youthful optimization. If you prefer for a glamorous wedding look, then consider about having slight golden yellow tone for your wedding arrangements and even for your wedding dresses. It will inevitably create some energetic and royal appearances. Green: If you are about to getting married during the spring season then wearing green color wedding dresses would be a perfect idea. In general, the green color often pins points the peaceful and refreshing tone. Orange: Generally, the orange color pinpoints the strong and being bold, in addition to that is also known for being an autumnal color. Wearing orange color wedding dress will surely be a fun-filled event on your wedding occasion. Purple: Wearing a purple wedding dress will give you an elegant look and also gives you the feeling of being luxurious on your big day. Modern creative people often prefer to wear a light purple colored wedding dress to uplift their wedding moment with the elegance look. Red: If you prefer to be romantic on your wedding event, then wearing a red wedding dress would be the best choice. Apart from driving all the attention to you, red wedding dress would be the most suitable choice for the wedding events happening during the winter season. Brown: For marriages which are held with the vintage themes means, wearing a brown wedding gown would be a perfect choice. 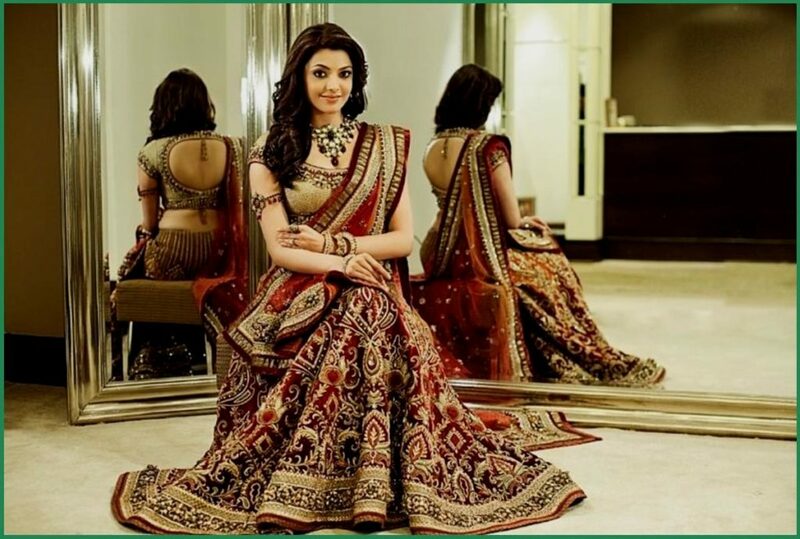 Having a traditional brown wedding gown on your wedding day would surely make your wedding fulfilled with general aspect along with stability. Black: Well, it may sound and feel awkward to all. But if you prefer to have clean modern-day wedding event, then consider about favoring the classic color black. Wearing a black color cap sleeve as your wedding dress would be the perfect choice for portraying strong an authoritative character. In addition to those above-listed colors, you can even try out something unique on your wedding event in order to grab the attention of all guests/people. You can often see some wedding dresses would be in same color right from top to bottom irrespective of its lace, textures and other accessories. In such cases try to get the matching colored shoes and different touching accents. In fact, you can try out colored accessories like headwear, jewels, and even the umbrella too. It is advised to pick the bronze which will be entirely matched with your wedding dress while wearing those accessories. Right now, wearing an Ombre shade wedding gown is in peak trend all over the world, especially when it comes to the United States of America and as well as in the Asian Sub-continent India. When it comes to choosing bridal wedding dresses, always prefers to pick the color matching with the groom’s outfit. So, finding the wedding dress for both bride and groom with complementing colors would be the best choice. Selecting bridal wedding dress would be more complicated than the groom’s wedding dress. It doesn’t matter what groom wears on the big day. However, bride’s wedding dress would get noticed among all the guests who arrive for the big occasion. Wearing a dream wedding dress on the most important day of your life is a vital thing; here are the top tips which help you to pick the right and perfect wedding dress. For many picking, the perfect wedding dresses would be the most challenging task to do. If you are such person, then consider getting mingled with your friends or relatives while purchasing your wedding dresses. Getting suggestions from the companions on picking the bridal wedding dresses will work well when it comes to the confusion of choosing dresses from more than one option. In many cases, couples might fall as prey and a free lot of money while purchasing bridal wedding dresses. To avoid such things, get a light budget frame for your wedding dress purchase. You may need to spend little more or less while billing, but having a specific budget rate in mind will surely help you to keep things under control on your wedding dress shopping. And most importantly always ensure that you are purchasing at best prices by comparing with other sellers. Search around for dress shops that are in your price range, I recommend visiting Winnie Couture Houston for great quality dresses at fantastic prices! If you prefer to wear wedding gowns or cap sleeve top for your wedding event, then buying the exact sized dress will fit well and makes you feel comfortable during the big day event. In basis, the size and length of the dress will get varied according to the event’s nature. If you are opting the formal wedding ceremony then preferring the base size which is floor length would suit well. In case of the ultra-official wedding ceremony, then choosing a dress with the extra cathedral train would look good. On your wedding day, you need to look gorgeous. To have such elegant look, you need to wear appropriate clothing which will matches pretty well with your body shape. Considering your physical appearances, picking your wedding dresses would add extra elegance to your presentations. Preferring wedding jewels based on your wedding gowns or any other peculiar wedding dresses would enrich your look on your wedding day. In general women’s beauty will be enhanced when they wear bright jewels. You need to be more comfortable on the state during your wedding event. So while picking the suitable wedding dresses, make sure the structure in which the dresses made suits you very well. Else you need to face severe consequences like itchy and so throughout the day. Picking right wedding dress based on the wedding theme organized by the wedding organizers is essential to avoid awkwardness. For example, unless you are going to have ultra formal themed wedding ceremony never opts for the wedding train format dresses. In fact, with the proper planning, you can save a lot of money by cutting down the unnecessary accessories of your wedding dresses. With numerous options are available in wedding dress code, picking the right one is more important. Wearing a cap sleeve wedding dress during the winter season would be the utterly worse decision. Always choose the appropriate dress code according to the situation and wedding plan. So that you can feel good comfortable with your dress. Experts often take care of such works. In general, the alteration is never appreciated. However, for theme wedding ceremony opting for such custom decoration and extra changes are welcomed to make unique wedding dresses. It is highly advised to cross-check those alterations which are done and ensure that you are comfortable to wear. Alterations over wedding dress especially over wedding gowns where extra costumes will be added if wedding event held during the winter seasons. By doing so, the bride will feel certain warmness during the special occasions. In simple words, the physical appearances of such altered wedding dress will look precisely like the multi-layered dress. With all those tips and suggestion, brides can able to select their wedding dresses which they would love to wear on the previous occasion, wedding day. Previous What Will Android P Have to Offer? Next How to Choose the Best Insurance Policy for your Car?